Coughs, sniffles and itches — ugh. 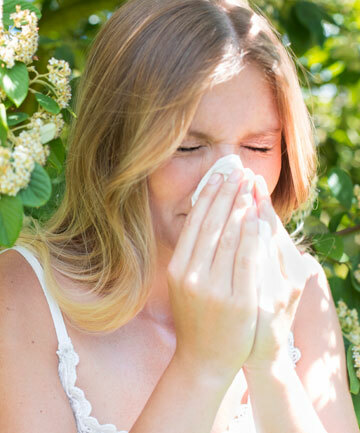 As allergy season continues to wreak havoc on the estimated 50 million Americans who suffer each season, finding a solution to ease your symptoms might sometimes feel frustrating and hopeless. "As seasons change, pollens are released into the air. Trees, grass, weed pollen, mold spores, bee venom, pet dander, among others, emit tiny particles into the air, which your immune system recognizes as a foreign substance. This can cause symptoms including itchy and watery nose, red and itchy eyes, runny and congested nose, sneezing, coughing, hives, rash or even severe anaphylaxis allergic reactions," explains Epitomedical chief medical officer and founder of the Vedius app, Constantine George, MD. To help manage this uncomfortable time of year, it's important to be equipped with the right facts about treatment and suggestions from the pros. After all, you don't want to be blowing your nose and refilling your eyes with drops when you're traveling for a summer vacation or attending one of those countless weddings. Here, the myth-breaking guide to spring allergies — with actual advice you can use to feel better ASAP. SEE NEXT PAGE: Myth: You're allergic to flowers.